So your taking a vacation for some much needed R & R, but this doesn’t mean your hair needs to take a break from looking beautiful. I quote Alec Baldwin in an episode of 30 Rock “Your hair is your head-suit.” Ladies no matter where you are, or where your going, let’s always make sure our head-suit looks perfect. You have enough to think about when packing to travel, so I’m going to make it easy for you to pick out the best travel hair dryer to take with you. These are all dual voltage hair dryers so no need to worry. Travel hair dryers have become more stylish than ever before. Amika makes amazing styling products and tools. Ceramic, tourmaline and ionic technology, this travel blow dry will get your hair dry so you can be on your way to enjoying your vaycay. Not only will your hair dry fast, but with far infrared technology it will leave your hair smooth, soft and shiny. Let me start with OMG this is so pretty, I just love pink. Besides being an adorable travel blow dryer and travel flat iron combo, they work just like their big sisters. 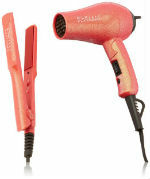 The blow dryer is packed with tourmaline ceramic technology to help keep out humidity, and reduce frizz. The Flat iron has the same technology to allow for even heat distribution on the tourmaline flat iron plates to your hair. Bonus travel hair brush helps brush out the sand from the beach and fits perfect in the travel case included in this beauty tool travel kit. Full size Babyliss are some of the best hair dryers, and just because this is a compact travel blow dryer, doesn’t mean it doesn’t pack a powerful dry. 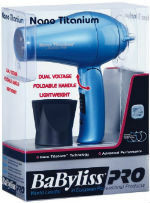 This travel hair dryer is Nano Titanium which means it will dry you hair fast and give you beautiful shine. Folds up for easy packing. These 3 hair dryers have some serious power for there size. Let’s make doing hair on vacation quick and easy. That’s exactly what these travel hair dryers will do for you. Seriously I’m warning you. DO NOT TOUCH THE HOTEL HAIR DRYER. Your hair will cry if you do. Instead invest in a travel blow dryer, so your hair can have the care it deserves while you are jet setting around the world.